Think about the last time you rode a bicycle. For participants in last week’s Create a Commuter workshop at the Native American Youth and Family Center (NAYA), it ranged from “one week ago” to “over ten years.” Five of the participants had not ridden in over seven years. The first group ride of the day was a mixture of nerves and excitement, but everyone did a fantastic job. Our Create a Commuter workshops go beyond bicycles and encourage people to develop new skills or tackle a personal challenge. Natalie Mitchell, one of the NAYA Career Skills Development Coaches, said, “I witnessed a lot of new confidence levels.” This confidence will not only help on the road, but for many new commuters, will help them as they search for employment. Sometimes just having a bicycle to ride is not enough. 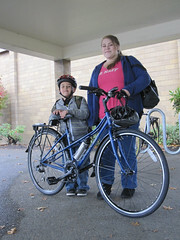 The Create a Commuter workshops also help to build connections. Alex went on to say, “I would also like to find other people to ride with.” After the second ride, another participant, Irving, told us his favorite part was the camaraderie. Thanks go out to everyone at NAYA for providing a supportive environment and helping register participants for the workshop. 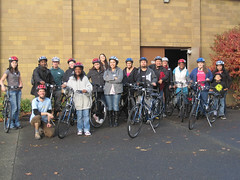 Also thanks go out to our amazing volunteers who helped assemble the bicycles and facilitate the workshop. We couldn’t provide community programs like Create a Commuter without the assistance of so many volunteers, supporters and dedicated partners like NAYA. More photos from our workshop at NAYA can be found on our Flickr page here.